As I waited in the terminal I pulled out a basketball rules book and started to review for the upcoming season. A little girl, probably four years old, made eye contact with me from across the room and zipped over and grabbed the book from my hands. Her eyes sparkling with life and mischief matched her giggles as she ran away with the book. Her horrified mother intercepted and returned my book, apologizing profusely. I laughed, I thought that it was a great break in the “non-action” of waiting. Soon afterwards the girl was transfixed on a video that was playing on her parents laptop. I pulled out my phone and started listening to Eddie Rabbits “Driving my life away” and other tunes. Waiting….just waiting. If I get to go, great. If not, so be it. 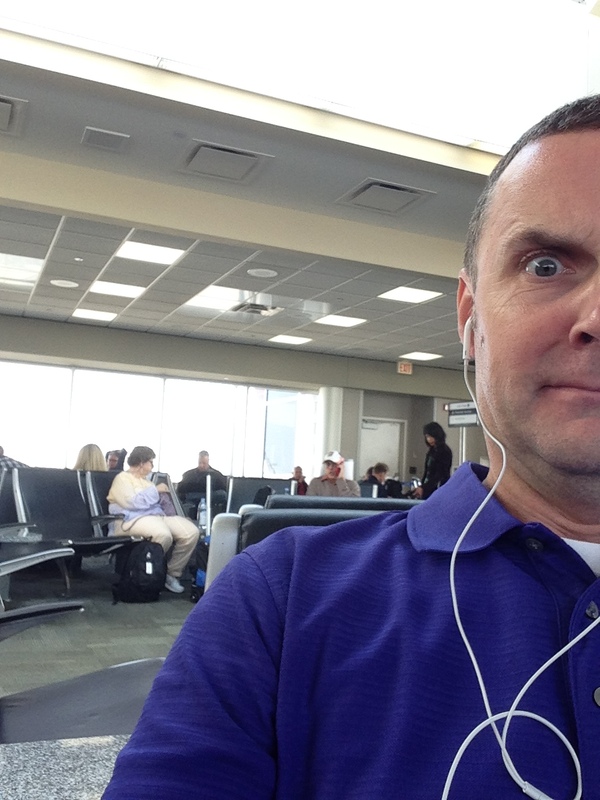 Six hours into the wait….I’m bored and try to stay out of trouble, as Connie had gotten on an earlier flight. Around the terminal, in a quiet corner, I spied a man in his fifties, gently spoon-feeding his father who was sitting in a wheelchair. Buried in a sea of blankets the old man enjoyed every bite, and when boarding his face lit up like a kid on Christmas morn. I could only imagine the story behind that trip. That’s my problem, airports are such impersonal places. Thousands of people, very little if any “person”. All walking briskly, all with places to go, flights to catch, meetings to attend, wanting to be somewhere else….expect for the big dude ten feet from me, he seems perfectly content to nap the afternoon away in the terminal. Finally boarded and ready to go I’m as cool as a cucumber. Flying doesn’t bother me like it used too. I still marvel at the beauty of the earth below. Iowa’s landscape is full of corn and soybean fields ready to be harvested. I spy combines chewing up corn stalks, tractors with wagons moving into place and a single school bus making its way along a gravel road. Good God in Heaven….its beautiful. Those thunderstorms that I kept an eye on are now close enough to see, the pilot takes us up to 36 thousand feet to get out of the turbulence, but I can see the lightning flicker and dance through those monstrous anvil shaped storm clouds. There’s many of them…and under them someone is getting some serious rain, wind and lightning. Soon, with the sun hugging the horizon, it breaks through a slit in the clouds like a bright red eye squinting its last for the day. Shortly thereafter, with my ears popping, I know that we’re descending for Dallas. Once on the ground I meet up with Connie and our daughter Jordan, whom we’ve come to visit and see graduate. 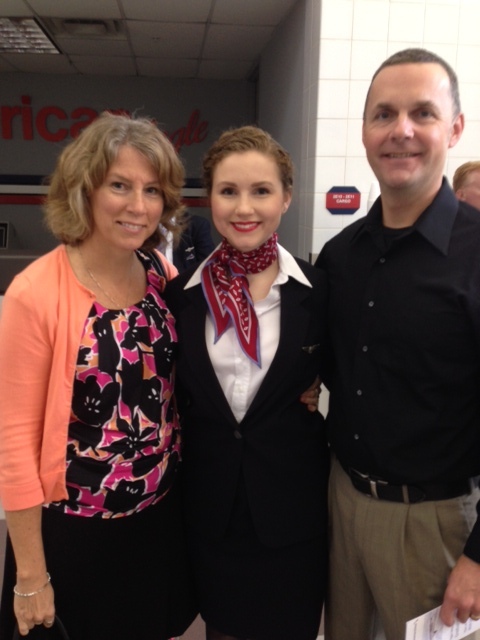 She’s a flight attendant now…and we couldn’t be happier for her. She’s thrilled to death, of course. Connie, Jordan and I. Proud parents. Adventure is hers!! We’re in Dallas less than 24 hours. Its a whirlwind visit. I think to myself that I’ve visited Dallas Texas more often in the last two years than I have our neighboring state Illinois. Go figure. My “flying medicine”. 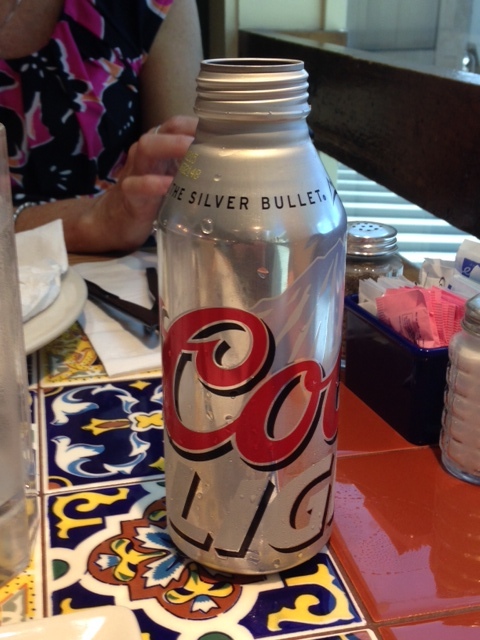 No…just kidding, though this delicious Coors Light hit the spot during lunch. I watch from above as the Mississippi River passes below, then river basin turns into the patchwork quilt of farm fields, timber and small towns. Folks from other, more worldly and sophisticated places call Iowa and places like it “fly over country”….meaning there’s nothing “down there” to stop and look at. I’ll gladly fly over it too, just make sure that you fly me back to it before supper, I’m an Iowa boy. Loved this! I, too, have a sense of wonder when I fly. Your daughter looks pleased as punch to have you both standing next to her 🙂 What a cutie! Thanks MJ. Have fun at your polish days fest!